The theme this year for the Ramadhan Buffet @ Pearl International Hotel KL was "hot-on-your-plate action stalls" which wasn't really a new concept, but one which is always good in my books. We saw our favourite food served piping hot done a-la-minute. The first thing that caught my eye this time around wasn't the satay (yes, they have my favourite satays too), but rather, it was the Lamb Carving Station. Served on a rotational basis, we were presented either with the Harissa marinated whole lamb, the fresh mix herb marinated whole lamb, or the Arabic marinated whole lamb. I did like the taste of the "kambing golek", moist and tender going well with the accompanying mint sauce. With more than 100 authentic Malaysian dishes served from the kitchen of Pearl International Hotel, it does not matter if you came with your family, or with friends, everyone is bound to find something they like. 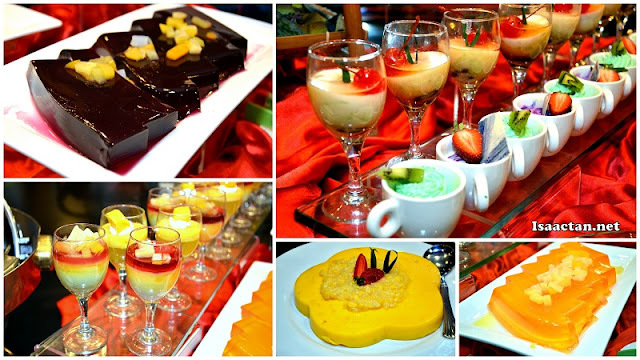 Spoilt for choice, we had numerous Main Courses laid out, Kerabu Action Salad Station, Malaysian Pickles, Soups, Live Hawker Action stalls, and lots of desserts for the sweet tooth. 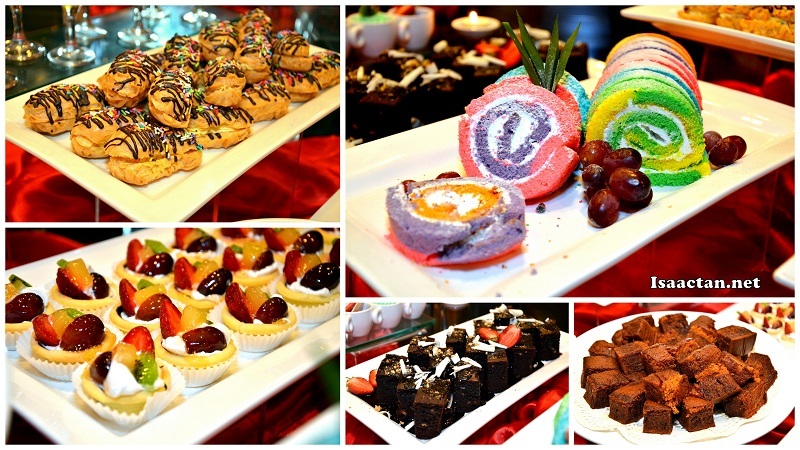 Personally I found the dessert spread for their Ramadhan buffet very colourful, with desserts ranging from western favourites; chocolate brownies, fruit tart, mocha walnut cake, to assorted Malay kuihs. Check out some of the photos I managed to capture below. Highlighting a myriad of mouth-watering unique dishes from all over Malaysia, diners can expect to come back for more as the dishes from Pearl International Hotel's buffet line are different daily. Oh, Janice loved the ice-cream, even though it wasn't any "branded" ice-creams, it was good enough. 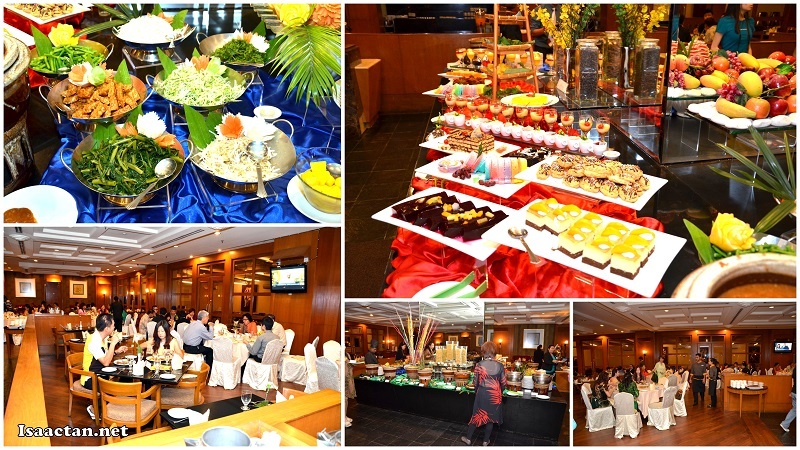 The "Feast of Ramadhan - Jom Berbuka Puasa @ Pearl" starts from 12th July 2013 all the way through Ramadhan until 6th August 2013. Priced at RM78++ for adults and RM38++ for children below the age of 12, this was one of the more affordable buffet I've come across recently. Promotional Gift Vouchers valued at RM680 nett per booklet of 10 vouchers (a saving of 25% off normal rate) can be bought from Lawrence Khoh 012-3706108 or just contact 03-79831111 ext 3309 for details. OMG, look at the ayam golek! It got me drooling! ...and come to think of it, I just recall that we were there one Ramadhan some years ago, and they had all the food...all the nice hawker stalls - stuff cooked on the spot...and I feasted on the very very nice fried lala from one of them - a double helping...and ended up with my first gout attack ever. The pain was killing and I could not walk for days. Sigh!!!!! My days of sheer indulgence are over! Sobssss!!!!!! whoa, all the big big FOOOODD!!! if i can eat alot, i think that price is really reasonable! !